جدی زاهد, جواد, رستمی, بهزاد. (1396). بررسی تغییرهای تراوایی به دلیل رسوب نمک در فرایند ترسیب گاز کربن دی اکسید. 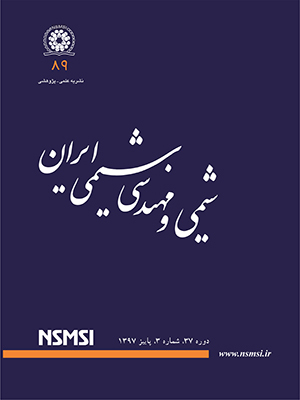 نشریه شیمی و مهندسی شیمی ایران, 36(3), 187-197. جواد جدی زاهد; بهزاد رستمی. "بررسی تغییرهای تراوایی به دلیل رسوب نمک در فرایند ترسیب گاز کربن دی اکسید". نشریه شیمی و مهندسی شیمی ایران, 36, 3, 1396, 187-197. جدی زاهد, جواد, رستمی, بهزاد. (1396). 'بررسی تغییرهای تراوایی به دلیل رسوب نمک در فرایند ترسیب گاز کربن دی اکسید', نشریه شیمی و مهندسی شیمی ایران, 36(3), pp. 187-197. جدی زاهد, جواد, رستمی, بهزاد. بررسی تغییرهای تراوایی به دلیل رسوب نمک در فرایند ترسیب گاز کربن دی اکسید. نشریه شیمی و مهندسی شیمی ایران, 1396; 36(3): 187-197. ترسیب کربن دی اکسید یکی از بهترین و مؤثرترین روش های موجود برای کاهش آزادسازی کربن دی اکسید در جو می­ باشد. از نظر ظرفیت ذخیره سازی آبده های شور بالاترین ظرفیت ذخیره سازی را دارا می ­باشند. تزریق مقدار زیادی از گاز در مخازن زیر زمینی عمیق منجر به رسوب نمک در ناحیه اطراف چاه تزریقی می­ شود. از آنجا که حجم زیادی از گاز کربن دی اکسید می ­بایست در سازندهای زیرزمینی برای مدت طولانی(کمینه 30 سال) ذخیره شود، تزریق پذیری موضوعی بسیار مهم است. رسوب نمک ناشی از فرایند تبخیر در اطراف چاه تزریقی می ­تواند به شدت تزریق پذیری را کاهش دهد. هدف از این مطالعه بررسی اثر شدت جریان تزریق گاز کربن دی اکسید و همچنین میزان شوری آب نمک سازندی بر روی تغییرهای تزریق پذیری به دلیل رسوب نمک می­باشد. نتیجه­ های این مطالعه نشان می ­دهد چندین عامل متقابل، با تغییر شدت جریان تزریق و شوری آب سازندی، بر روی تزریق پذیری تأثیر می­ گذارند که اثر متقابل آن ها تعیین کننده ی میزان تزریق پذیری خواهد بود. آنالیز نتیجه ­های تراوایی نهایی نشان داد میزان رسوب نمک با افزایش شدت جریان تزریق و کاهش شوری آب سازندی، کم می­ شود. آنالیز عدد پکلت نشان می­دهد پروفایل رسوب نمک با تغییر شدت جریان تزریق و درجه ی شوری تغییر می­ کند اما تابع شدیدتری نسبت به تغییرهای شدت جریان تزریق می ­باشد. نتیجه­ های این مطالعه برای کالیبره کردن مدل تغییرهای تراوایی به دلیل رسوب نمک مورد استفاده قرار گرفت. Bachu S., Adams J.J., Sequestration of CO2 in Geological Media in Response to Climate Change: Capacity of Deep Saline Aquifers to Sequester CO2 in Solution, Energy Conversion and Management, 44(20): 3151-3175 (2003). صفرزاده م.ا.، مطهری م.، بهینه­سازی همزمان ذخیره­سازی زیرزمینی گاز و ازدیاد برداشت نفت در فرایند تزریق گاز کربن دی‌اکسید با استفاده از روش الگوریتم ژنتیک چند هدفه، نشریه شیمی و مهندسی شیمی ایران، 33(3): 85 تا 97 (2014). Liu H.-H., Zhang G., Yi Z., Wang Y., A Permeability-Change Relationship in the Dryout Zone for CO2 Injection into Saline Aquifers, International Journal of Greenhouse Gas Control, 15: 42-47 (2013). Le D., Mahadevan J., Productivity Loss in Gas Wells Caused by Salt Deposition, Society of Petroleum Engineers, 16(04), In: Paper SPE-132606-PA, (2011). Van Dorp QT., Slijkhuis M., Zitha PLJ., "Salt Precipitation in Gas Reservoirs", In: Paper SPE 122140-MS Presented at 8th European Formation Damage Conference, Scheveningen, The Netherlands, 27-29 May (2009). Zuluaga E., Monsalve JC., "Water Vaporization in Gas Reservoirs", In: Paper SPE 84829-MS Presented at the SPE Eastern Regional Miting, Pittsburgh, Pennsylvania, 6-10 September (2003). Zuluaga E., Munoz N.I., Obando G.A., "An Experimental Study to Evaluate Water Vaporisation and Formation Damage Caused by Dry Gas Flow Through Porous Media", In: Paper SPE 68335-MS Presented at International Symposium on Oilfield Scale, Aberdeen, United Kingdom, 30-31 January (2001). Peysson Y., Permeability Alteration Induced by Drying of Brines in Porous Media, Eur. Phys. J. Appl. Phys., 60(2), (2012). Peysson Y., André L., Azaroual M., Well Injectivity During CO2 Storage Operations in Deep Saline Aquifers—Part 1: Experimental Investigation of Drying Effects, Salt Precipitation and Capillary Forces, International Journal of GreenhouseGas Control, 22: 291-300, (2014). Bacci G., Korre A., Durucan S., Experimental Investigation into Salt Precipitation During CO2 Injection in Saline Aquifers, Energy Procedia, 4: 4450-4456, (2011). Ott H., Roels S.M., De Kloe K., Salt Precipitation Due to Supercritical Gas Injection: I. Capillary-Driven Flow in Unimodal Sandstone, International Journal of GreenhouseGas Control,43, 247-255 ,(2015). Azin R., Mehrabi N., Osfouri S., Asgari M., Experimental Study of CO2 – Saline Aquifer-Carbonate Rock Interaction During CO2 Sequestration, Procedia Earth and Planetary Science, 15: 413-420, (2015). Smith M.M., Sholokhova Y., Hao Y., Carroll S.A., CO2-Induced Dissolution of Low Permeability Carbonates. Part I: Characterization and Experiments, Advances in Water Resources, 62: 370-387, (2013). Yu Z., Liu L., Yang S., Li S., Yang Y., An Experimental Study of CO2–Brine–Rock Interaction at in Situ Pressure–Temperature Reservoir Conditions, Chemical Geology, 326–327: 88-101 (2012). Zhao D.F., Liao X.W., Yin D.D., An Experimental Study for the Effect of CO2-Brine-Rock Interaction on Reservoir Physical Properties, Journal of the Energy Institute, 88(1): 27-35, (2015). Pruess K., Müller N., Formation Dry-out From CO2 Injection into Saline Aquifers: 1. Effects of Solids Precipitation and Their Mitigation, Water Resources Research, 45(3), (2009). Nordbotten J., Celia M., Bachu S., Injection and Storage of CO2 in Deep Saline Aquifers: Analytical Solution for CO2 Plume Evolution During Injection, Transport in Porous Media, 58(3): 339-360, (2005). Racht V.G., "Fundamentals of Fractured Reservoir Engineering", Vol. 12, 1st ed., Elsevier Science (2007). Peysson Y., Fleury M., Blázquez-Pascual V., Drying Rate Measurements in Convection- and Diffusion-Driven Conditions on a Shaly Sandstone Using Nuclear Magnetic Resonance, Transport in Porous Media, 90(3): 1001-1016, (2011). Jafari Raad S.M., Azin R., Osfouri S., Measurement of CO2 Diffusivity in Synthetic and Saline Aquifer Solutions at Reservoir Conditions: the Role of Ion Interactions, Heat and Mass Transfer, 51(11): 1587-1595, (2015). Huinink H.P., Pel L., Michels M.A.J., How Ions Distribute in a Drying Porous Medium: A Simple Model, Physics of Fluids, 14(4): 1389-1395, (2002). Duan Z., Sun R., Zhu C., Chou I.M., An Improved Model for the Calculation of CO2 Solubility in Aqueous Solutions Containing Na+, K+, Ca2+, Mg2+, Cl−, and SO42−, Marine Chemistry, 98(2–4): 131-139, (2006). Pruess K., ECO2M: A TOUGH2 Fluid Property Module for Mixtures of Water, NaCl, and CO2, Including Super- and Sub-Critical Conditions, and Phase Change Between Liquid and Gaseous CO2, Earth Sciences Division, Lawrence Berkeley National Laboratory University of California, Berkeley, CA 94720 (2011). Verma A., Pruess K., Thermohydrological Conditions and Silica Redistribution Near High-Level Nuclear Wastes Emplaced in Saturated Geological Formations, Journal of Geophysical Research: Solid Earth, 93(B2): 1159-1173 (1988).